Tidesnapper aquatic mount concept art. Tidesnapper was a Kickstarter reward for passing 9,500 backers goal. The Tidesnapper is an underwater mount that has the ability to glide through the water. Basic mounts are obtained through an early quest that is available to all players in starting areas. Players assign cosmetic skins to a character on their account from the account management page. 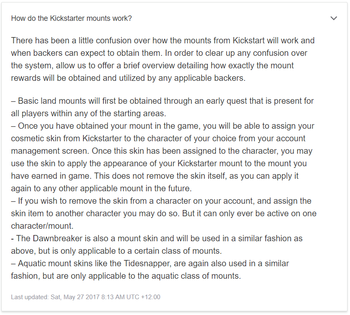 The skin can then be applied to change the appearance of the mount that was earned in game. This does not remove the skin itself. It can be applied again to any other applicable mount in the future. Players may remove the skin from a character and assign it to another character on their account. Skins can only ever be active on one character and one mount. The Dawnbreaker mount skin is used in a similar fashion as described, but is only applicable to a certain class of mounts. 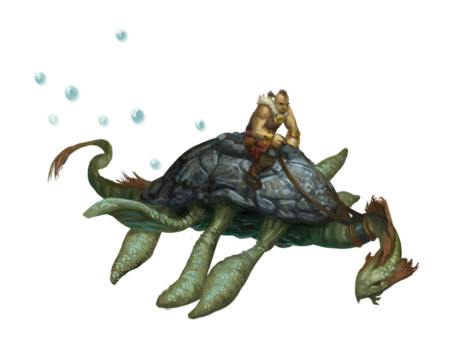 Aquatic mount skins, like the Tidesnapper, are also used in a similar fashion, but are only applicable to the aquatic class of mounts. ↑ 1.0 1.1 Ashes of Creation Kickstarter - Over 9,500 Backers and Counting!! This page's content was last modified on 18 February 2019, at 06:01.